Revamp Your Trade Show Table To Be A Marketing Maniac! Looking for another way to put your brand out there for new potential customers? Our table throws are made of high quality material that fit almost any size table. 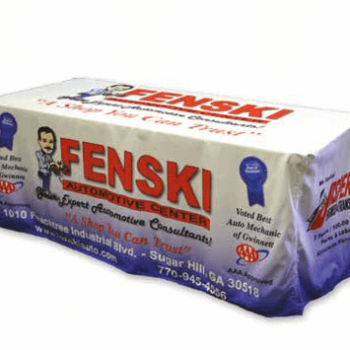 Table throws are most popularly used at trade shows, but can also be used in any office environment. These throws could add a new touch to an existing waiting room table or any other table you are not already utilizing. Our premium quality Table Throws are easy to care for, washable and easy to store and ship. 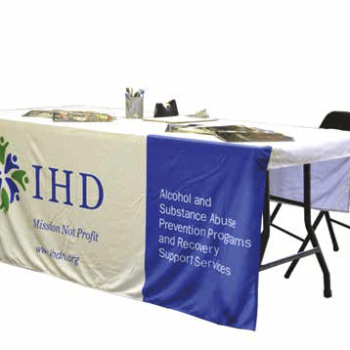 All table throws are printed using full color, digital dye-sublimation printing process. Available in 6ft & 8ft. Rather than laying close to the table as the Fitted Table Throws do, this design flows and drapes loosely over the sides of your table. This is the ideal table throw for a display that will be viewed from all sides. These premium quality Table Throws are easy to care for, washable and easy to store and ship. 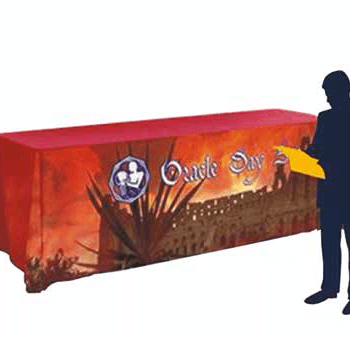 All table throws are printed using full color, digital dye-sublimation printing process. Available in 6ft & 8ft. For your next Tradeshow Table. By far one our most popular Table Throws, this style covers all four sides of your table. These premium quality Table Throws are easy to care for, washable and easy to store and ship. All throws are printed using full color, digital dye-sublimation printing process.